A table can prove useful in a variety of situations, and allow for clean design lines. Tables are great ways of displaying content on your pages in an organised manner. Using these are super simple. The Table Element is responsive by default, meaning your content will look great, even on mobile. Each cell within the Table Element is it's own dropzone, meaning that you can drag other elements into the cell. For example, you can drag a Text Element or Image Element into a cell. 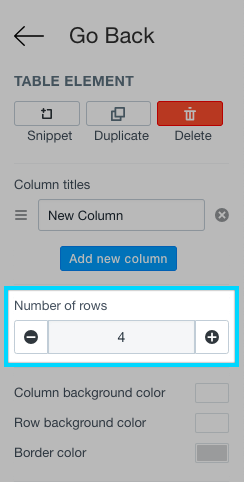 Adding rows to your Table Element is super simple. The Table Element offers a wide range of customisations for the cells. These include various spacing controls and width controls. Border width will control the border that is around the cells. Modify this if you would like a border to appear around each cell in your Table Element. Column spacing controls the spacing that is between each column. Row spacing modifies the spacing between each row of the table. Border radius controls the radius that is added to the Table Elements corners. You can change the background colors of the cells to better match your theme.